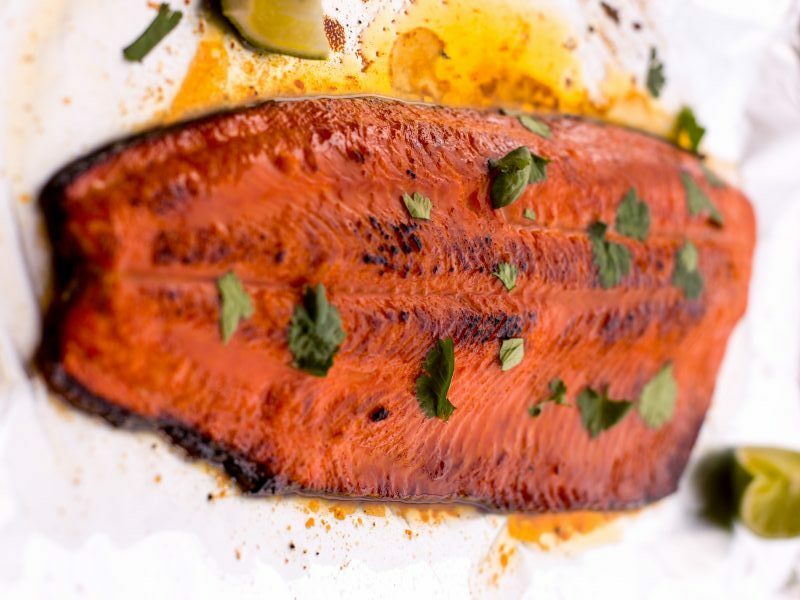 Any recipe that includes the words "honey butter" certainly has our attention, and this one — courtesy of the Bristol Bay Regional Seafood Development Association — is the savory, spicy, sweet take on salmon perfection we love to make pretty much any time of the year. Pat the salmon dry and place it on a foil-lined baking sheet. Season the fillet generously with salt. In a small saucepan, melt the butter. Stir in the garlic, Sriracha sauce and honey, cooking 2 minutes until melted together and fragrant. Remove from heat and remove garlic pieces from sauce. Drizzle half of the Sriracha honey butter over the salmon to evenly coat, reserving the rest of the butter for serving. Place the salmon in the oven on the middle-upper rack (about 6 inches from the heat source. Broil the salmon, keeping a close eye on it, until cooked to medium in the center, about 6 minutes. Serve the salmon promptly with cilantro, lime wedges, and an additional drizzle of Sriracha honey butter.